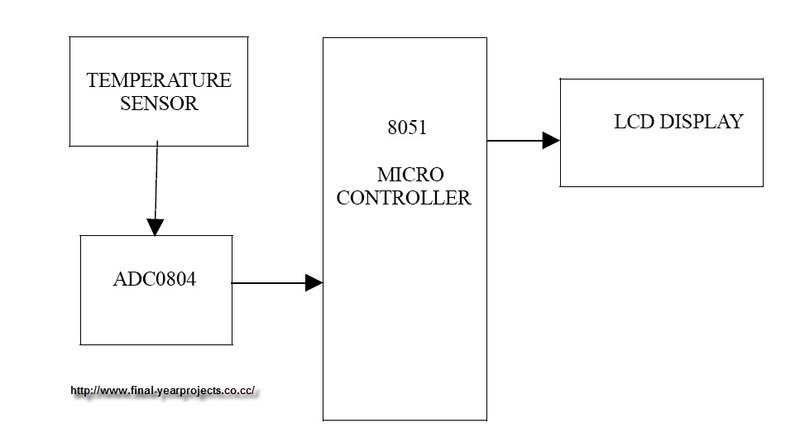 This is a good ECE project report on Temperature Monitoring System using microcontroller 8051. This is simple low cost circuit which can be mainly used in large scale industries to detect the high temperature and take immediate measures. This circuit is used to sense the temperature at a place. It indicates the temperature on the LCD with the help of microcontroller. You can also Subscribe to FINAL YEAR PROJECT'S by Email for more such Projects and Seminar. 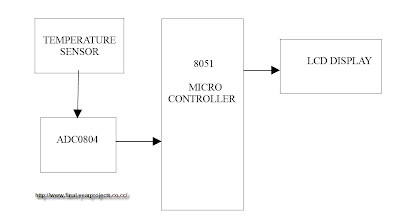 The above image shows the block diagram of Temperature Monitoring System which includes temperature sensor, ADC, microcontroller and LCD. LM35 is used as temperature sensor it senses the temperature. The output of Temperature sensor is in the form of analog signal.The circuit diagram of the project is also included in the project. Also include Microcontroller source code and programming. Use the report for your reference and study only.